Grab the gold & the girl with Achilles! 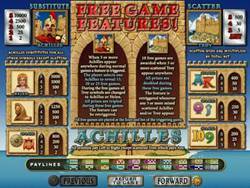 Achilles Slot - Join up with Achilles and the army of Greek soldiers as they go off to defend their beautiful and beloved Helen. Feel the excitement as you watch the Greeks beat the army of Trojans. Achilles has 2 features, the first is the Achilles Bonus Feature and the second is the Troy Bonus Feature. When a minimum of 3 Achilles appear scattered, you will win 15, 20, or 25 free games, and all the prizes are tripled. When a minimum of 3 Troy symbols appear scattered, you win 10 free games, and all the winnings will then be doubled. If the Achilles appears in your winning combinations - he will increase your payout and give you free spins if 3 or more appear scattered on the screen. There is also the random jackpot that can go off at anytime regardless of your bet amount.